WHO’S PACKING IN NEW YORK CITY? You Are Here:The Arbalest Quarrel Article 2nd Amendment WHO’S PACKING IN NEW YORK CITY? The person arrested, Elizabeth Anne Enderli, does possess a valid concealed carry permit. But, Mrs. Enderli’s concealed carry pistol permit was issued in Texas, not in New York City. Her Texas concealed carry license isn’t recognized as valid in New York City or, for that matter, anywhere else in the State of New York. Mrs. Enderli didn’t know that. And, since she doesn’t also possess a valid, unrestricted New York City handgun concealed carry license, she found herself spending the night in jail rather than in her hotel room. An otherwise law-abiding American citizen became a de facto law-breaker simply because she was unaware of the impact of New York City’s restrictive gun laws. Mrs. Enderli was subsequently arraigned on weapons possession charges. If convicted, she could face prison time. Is this just a quirk? Unfortunately, the answer is “no.” What happened to Mrs. Enderli, could happen to any honest and otherwise law-abiding American citizen, and, in fact, has happened to other honest, law-abiding American citizens – with disturbing regularity. But, this should not happen and need not happen. It would not happen if each State recognized the validity of a concealed handgun carry license issued by other States. Curiously, according to the New York Post, Texas does recognize the validity of New York firearms’ licenses, and has done so since 2006, even as New York does not recognize the validity of Texas firearms’ permits. This might explain why Mrs. Enderli thought, reasonably enough, although wrongly, that her Texas concealed handgun carry permit was valid in New York. Handgun license reciprocity ought not to be so blatantly one-sided. State reciprocity is not, we see, always reciprocal. Many States, such as New York, have archaic, draconian, and mind-numbingly convoluted firearms’ laws. These laws are clearly aimed at the average, law-abiding citizen, not the criminal, for they do virtually nothing to prevent criminals from obtaining guns and committing crimes with them. This is clear, obvious, and beyond reasonable refutation. But, the irrationality of firearms’ laws such as those of New York does not lead to the repeal of them because the goal of these laws has little if anything to do with reducing crimes committed with guns – and, so, the laws, not surprisingly, fail. Restrictive firearms’ laws have more to do with disarming the honest, law-abiding American citizen – and, so, the laws, on that score, not surprisingly, tend to succeed. New York’s firearms’ laws were, clearly enough, not designed – were never really designed – to encourage the exercise of one’s Second Amendment right of self-defense. They were designed, rather, with the opposite goal in mind: to discourage the exercise of that right. But, why is that? For honest American citizens, like Mrs. Enderli, who wish to exercise their natural right of self-defense, it is hardly welcoming to say: “if you wish to visit New York City, leave your firearms at home; your out-of-State handgun license is not valid here; and, if you feel that you must carry a handgun, then you would do well to secure an unrestricted New York City handgun carry license.” That license is, by the way, exceedingly difficult to obtain. An applicant for an unrestricted concealed handgun carry license must go through a lengthy, arduous, and expensive investigative process. And, after all is said and done, that applicant may, more often than not, end up empty-handed anyway because the modus operandi is “may issue,” not “shall issue.” In the State of New York – and even more particularly in New York City – the law-abiding American citizen does not have the inalienable right to carry a handgun, as guaranteed by and through the Second Amendment, only the privilege to do so, as warranted by and through government. And, as a privilege to carry a handgun, that privilege can be revoked at any time. So, once again, we ask: “Why is that?” Why does New York City – and the State of New York, for that matter – make it so difficult for the average, honest, law-abiding citizen to secure for him or herself a concealed handgun carry license merely to exercise the natural right of self-defense as embodied in and guaranteed by and though the Second Amendment to the U.S. Constitution? Why does New York City and the State of New York wish so fervently to discourage the exercise of a fundamental right? Is this due to the irrational notion that a firearm in the hands of the law-abiding citizen is more to be feared than a firearm in the hands of a criminal? Given the nature of New York’s draconian firearms’ laws – directed more to oppressing the law-abiding U.S. citizen than effectively restraining the criminal – one could reasonably draw that conclusion. Consider: the law-abiding American citizen and motorist needs one and only one valid driver’s license, issued by any one State, to secure the privilege of driving a motor vehicle lawfully in any other State. 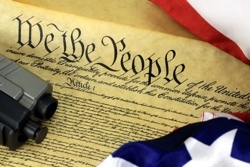 It is extremely odd that the same law-abiding American citizen must secure multiple State-issued concealed handgun carry licenses and permits, merely to exercise his or her natural right of self-defense, as sanctified in the Second Amendment. If the one license is so easy to obtain but amounts merely to a privilege proffered by a State government — which that government may refrain from granting to a citizen because the granting of a license to drive a vehicle on public roads is a government sanctioned privilege, not an inalienable right — why is the other so difficult to secure, when the right of self-defense – the effective right of self-defense that a firearm provides – is so much more than the mere privilege to drive an automobile on a public road? The right of self-defense is a basic and fundamental right existent in the individual and, therefore, a thing that neither a State Government, nor the federal government, can justifiably deny to a citizen, absent sufficient and good cause for doing so. For those readers who are interested in the issue of handgun carry reciprocity, we explain the merits of universal concealed handgun carry reciprocity, and respond to those who criticize it, in our article, “A Road Trip with a Handgun: The Case for Universal Handgun Reciprocity,” posted on July 12, 2015. In future articles we explain just how arduous, time-consuming, and expensive it is for a law-abiding American citizen to secure concealed handgun carry licenses and permits from a plethora of States. Copyright © 2015 Roger J Katz (Towne Criour), Stephen L. D’Andrilli (Publius) All Rights Reserved.